Drinks, cocktails, aperitifs – whatever you want to call them there is something rather civilised about relaxing with a good drink as the sun sets over the yardarm. Ice clinking against glass heralds the end of the working day and whether you are in some top notch bar or your own kitchen there is nothing wrong with making the most of it. Along with a delicious drink I like something to nibble at the same time. Not necessarily as elaborate as canapés (not on a school night, come on) but certainly a little salty treat to savour. Crisps can get a little greasy and nuts we tend to avoid as my daughter is allergic to them. 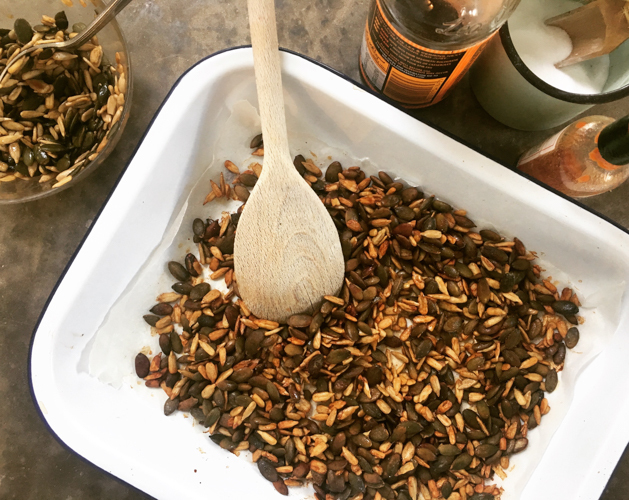 These seeds tick every box and prove a winner whenever I whip them up. 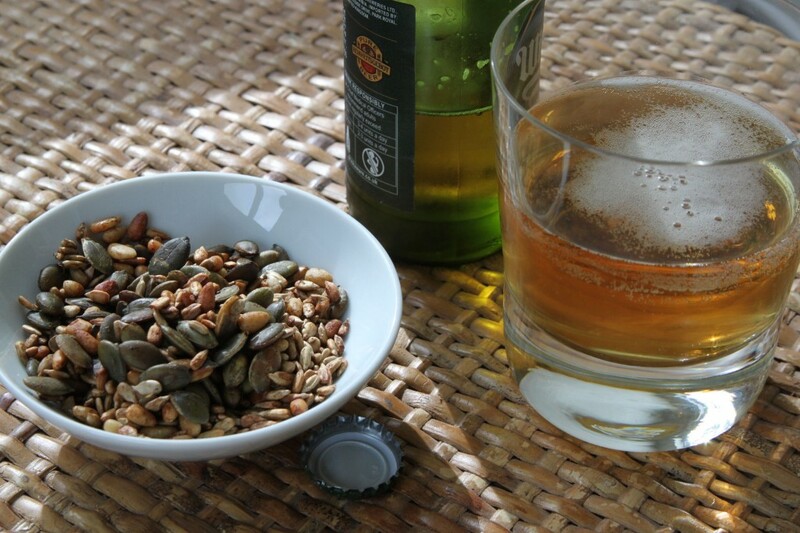 This isn’t the first time I’ve mentioned these utterly moreish seeds but I thought they deserved another shout out. So much better for you than crisps, this spicy snack is made in a matter of minutes and can be as spicy (or not) as you like. I often put a bowl of these out before lunch or supper and they go in a flash, the tangy heat seems irresistable. A great addition to a salad or to top off a bowl of hearty soup, these are properly useful to have in a jar in the kitchen. Fill little cellophane bags with them and give to friends. With a suitably festive ribbon these make a great Christmas present particularly if you are getting a little hamper together which I sometimes do. Mix everything together and spread in a single layer on a baking sheet. Bake for 5-6 minutes at 200, leave to cool briefly before adding a tiny sprinkle of salt and digging in. Happy New Year! Are you looking for something fresh, green and crunchy? After the Christmas cake which I ate almost entirely myself I know I am. 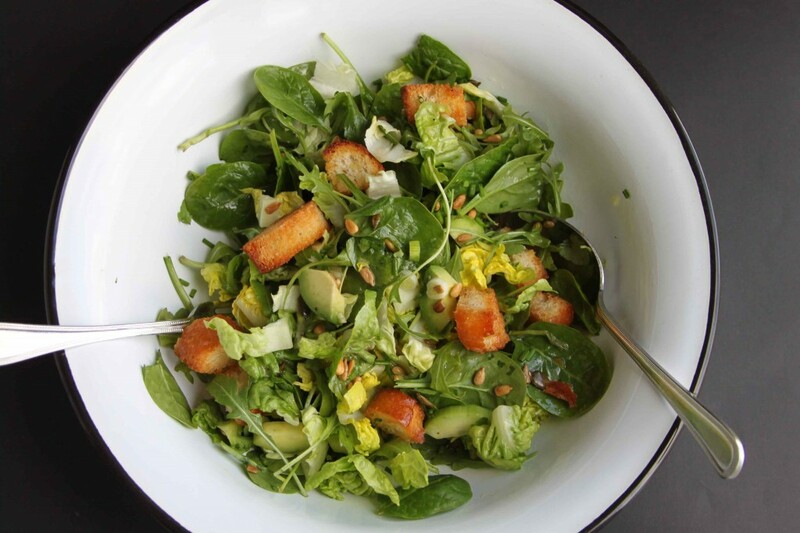 I love salads all year round and eat them in one form or other several days a week. However right now my craving knows no bounds. After what feels like weeks of rain the sun is out and the sky is blue. Tom and I went for a fabulous walk up beautiful Lewesdon Hill this morning and following a hose down (Tom, not me) I felt like something healthy, raw (mostly) and fresh to eat. This is the sort of salad we often have for a weekday lunch, perhaps with the addition of a few chunks of feta, maybe with soup if it is chilly or just good bread. Whatever the weather we often have this for a weekend lunch alongside a roast chicken, my children invariably picking out the bits they like best. It makes a lovely change from the usual roast with vegetables and feels a bit lighter – without losing out on the gorgeous golden roast chook. Perfect with a steak for supper, no need for chips because of the croutons and it is just the thing with any barbecued meat (I know, I know, barely a sign of Spring outside and I am already talking barbecues, I can’t help myself). I suspect you may have spotted the croutons so I must state that this is not diet food per se but it is so delicious, crisp and clean that I would certainly term it healthy. Whatever, this is the green salad I turn to most often and usually have the ingredients in my fridge. No spring onions or avocado? No matter, use what you have or what you like best. This is enough for my lunch just as it is, the croutons, seeds and avocado giving it substance but as ever, it is just a guideline, an idea to share. Preheat the oven to 200. Turn the cubes of bread in the tablespoon of oil, put in a small tin and bake for 5 minutes until golden, then sprinkle with a little salt. In a small bowl mix the garlic, sugar, mustard, lemon juice a good pinch of salt and some black pepper. Slowly add the 3 tablespoons of oil mixing well until emulsified. In a small frying pan heat the seeds until just turning golden. Cut up the little gem put it into a large salad bowl with the spinach, rocket and avocado. Add most of the dressing and toss the salad, you may not need it all but I find this amount just right. 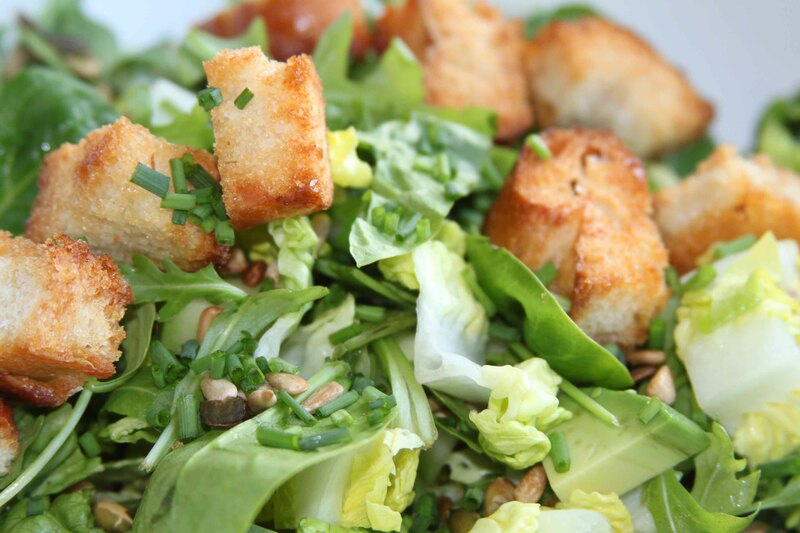 Scatter over the croutons and seeds and trickle over the rest of the dressing if you want. Snip the chives or other herbs over the top. Serves 2 for lunch or 2 adults and 2 children as a side dish. If you are looking for more healthy New Years’ crunch, try my carrot salad which I posted in January 2013.